Aiden goes to school on Tuesdays and Thursdays, but when holiday activities land on an "off" day, I try to take him up to his class to participate then bring him home. 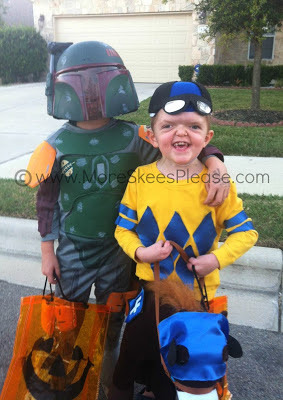 For weeks he begged me to take him to the annual costume parade that his school was putting on. 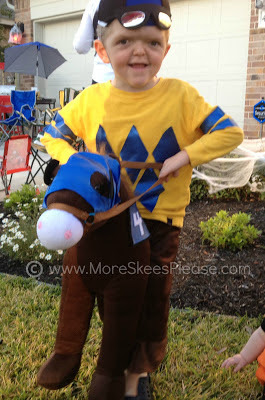 He couldn't wait to gear up in his jockey get-up and show his friends and teachers. All morning he asked "Is it time yet? Is it time yet?" I wasn't feeling well and if he hadn't have been so excited about it, I probably would have skipped it all together. But, being the good mom that I am ;) I took a shower, fed Hudson, got him dressed, got Aiden ready and loaded up the car headed for his school. When we got there, Hudson was crying and Aiden refused to participate. I stood in the hallway for a good 10 minutes trying to coax Aiden into doing what we came to do - I mean I TOOK A SHOWER FOR CRYING OUT LOUD - but alas, he threw a fit and we looked like idiots. I was a frazzled sweaty mess (so much for the shower) so we turned right back around and drove home. Awesome start to the day. As the day wore on (and I wore out) Hudson was extremely fussy. He wasn't his happy, easy-going self so I decided last minute to try to get him in to the doctor. The only appointment available was at 4:00 and knowing that it usually takes FOREVER, I was unsure if I'd be back in time to get everything ready for trick-or-treating. But we had to take the chance - and I'm glad we did. Turned out that Hudson had a double ear infection. Poor guy. While at the doctor, I glanced at my phone to see 5 missed calls from Ricky. Uh-oh. That's never a good sign. I called him back and he told me that Aiden threw a toy at Ethan leaving him with what was sure to be a pretty good shiner. He was okay but the only problem is our family pictures are Friday... Oh well! I zoomed home after grabbing Hudson's Rx at the pharmacy and raced around trying to get things ready. Ricky had already done most of it so I focused on getting Hudson fed and our costumes on. We were ready just in time and luckily, the rest of the evening was perfect. Ethan has been really into Star Wars lately and wanted to be a Boba Fet(?). I've never seen any of the movies so I couldn't tell you what the heck that is, but he was happy with the store-bought costume from Target so I was too. Aiden, on the other hand, picks more original costumes which means I get to get creative. Last year he was a "motorcycle dude" (Ethan was a dragon). This year, per his request, he wanted to be a jockey. My dad has owned a couple race horses and Aiden has loved every aspect of the sport so this didn't come as a surprise. I'm so happy with how Aiden's costume turned out. I did have to buy the "horse" he was riding on - and I think it really made it all come together - but the rest was hand made. Keep in mind, I DO NOT/CAN NOT sew worth anything so everything was either fused together with glue, staples or "Wunder Under" fabric adhesive. Worked like a charm! As for Hudson, I had seen the cutest idea on Pinterest for a newborn costume and since my creative juices were already flowing, I decided to tackle it as well. All it took was felt, real popped popcorn hand-sewn onto a little white hat, a red bow-tie and A LOT of time. And seriously???? I could not have been more excited about how it came out. 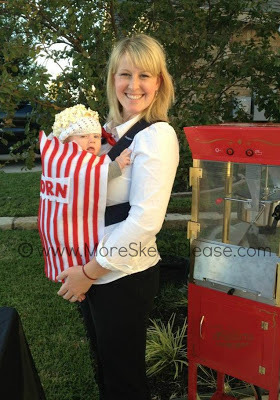 There were about 8-10 kiddos that went trick-or-treating together (with parents of course) and afterwards, everyone gathered on our driveway for grilled hot dogs, freshly popped popcorn, pizza and lots of other snacks. Oh, and to keep up with my "holiday drink" tradition, we made "Halloweenie-tinis" :) YUM! Halloween has never been one of my favorite holidays, but I absolutely loved every part of it this year. As the boys get older, I have a feeling I am going to love it more and more! Cute! I am sorry about Ethan's eye though. And Hudson's ears. Bummer. 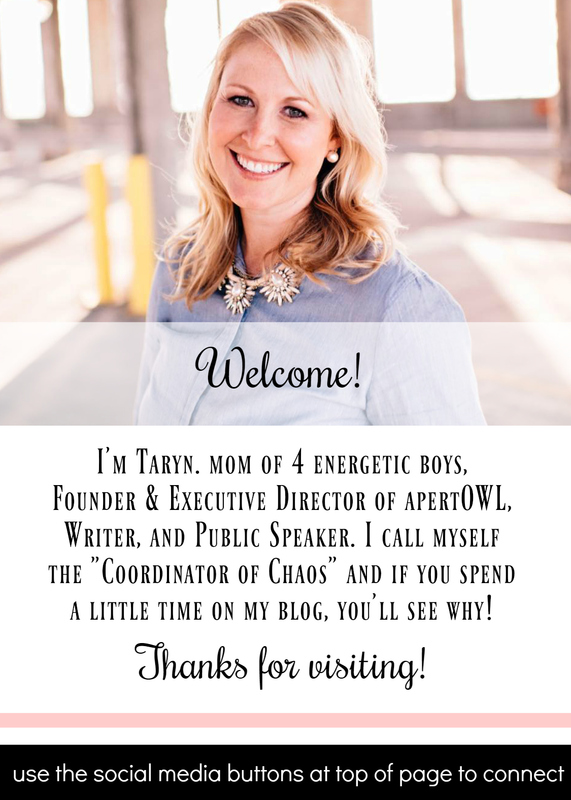 You are looking quite fit Ms. Taryn. Glad you snuck in a shot of yourself!! Oh my gosh their costumes all turned out AMAZING. Ethan should see all the Star Wars legos that Scott has in his office...oh and his Star Wars tattoo. James has already seen episodes 1-3 (the new ones)...Episode 1 has pod racing. I hope Hudson feels better soon.